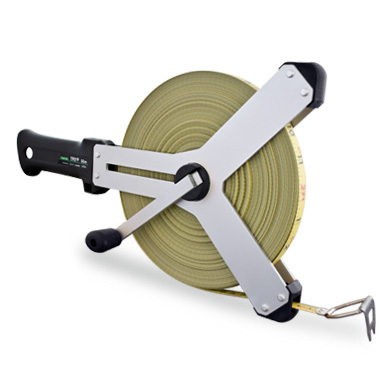 This heavy duty tape is constructed to withstand heavy on site measuring work, whilst the ‘Y’ shaped open frame design enables easy cleaning and maintenance after use. In addition to the ergonomic pistol grip, which offers the end-user comfort during use, the long winding lever and easy-grip winding knob makes rewinding fast and effective. The Prospector can be supplied with a ‘Tough Coat’ nylon coated steel or ‘Matt Coat’ polyester coated steel blade, both of which are accurate to EC Class II. 13mm ‘Tough Coat’ nylon coated steel or ‘Matt Coat’ polyester coated steel blade, accurate to EC Class II. ‘Y’ shaped aluminium frame with an ABS pistol hand grip.